BP is preparing to launch its static kill operation on Monday, with tests to be conducted and the actual operation tried as early as Tuesday. The static kill will be the first of a two-pronged effort from BP to permanently plug the compromised Macondo well. NEW YORK ( TheStreet) -- BP ( BP - Get Report)is preparing to launch its static kill operation on Monday, with tests to be conducted and the actual operation tried as early as Tuesday. The static kill will be the first of a two-pronged effort from BP to permanently plug the compromised Macondo well. The static kill operation is similar to previous failed "kill" operations attempted by BP, which involved pumping heavy drilling mud and cement into the Macondo well. BP hopes the static kill will succeed where the previous "kill" methods failed because of the cap now in place over the well. The cap, never meant to be a permanent solution to the leaking well, should make efforts to pump mud and cement into the well more effective, BP has said. BP plans to follow up the static kill with the relief well that has always been the No. 1 plan for ending the oil spill permanently. The static kill could be the beginning of the end of the oil spill, which began on April 20. The static kill uses mud to force back the pressure coming up through the well from the oil reservoir, and if successful, cement is then pumped on top of the mud to plug the well. BP hopes it will be successful, and safe, as the cap is already controlling pressure in the well, making it less likely that forcing mud into the well will cause damage. 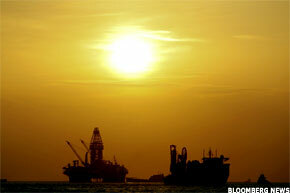 It's been two weeks since any oil leaked into the Gulf of Mexico. BP's share price received an immediate spike on the afternoon that the cap first stopped oil from flowing into the Gulf. At the beginning of July, BP shares were under $20. On Monday, BP shares were trading up and nearing the $40 mark, a share price level not seen since May 31. It's "kill and drill" for BP, but BP is saying that the static kill is no guaranteed success, and the government is stressing that the relief wells are the only true plug for the Macondo well. Retired U.S. Coast Guard Admiral Thad Allen, the government's point man on the oil spill response, said on Sunday that the static kill is not "the end all, be all." The House of Representative passed its oil spill response bill last Friday night, including an amendment to end the Obama Administration's temporary moratorium on deepwater drilling. However, the oil spill bill has stalled in the Senate. Passage of the bill may not occur until the fall. The government recently introduced the scaled-back oil spill bill in place of broad energy legislation in the hopes of passing something more quickly. The House vote showed Democrats from oil states pushing back against some of the harsher aspects of the oil spill bill, including the unlimited liability cap. Senator Robert Menendez (D-NJ), the author of the liability cap provision, is negotiating with oil-state Democrats, including Mary Landrieu (D-LA), who wants to prevent insurance costs from driving small and medium-sized independent oil and gas producers out of business. Thirty Democrats objected to the unlimited liability provision of the oil spill bill. The House oil spill bill included an amendment allowing oil and gas operators to create insurance pools to help keep insurance costs down. The House bill only got 209 votes, eight shy of the 217 needed for a majority of all House Members, but passed the House with enough representatives absent from the vote. The House also passed an amendment to end the deepwater drilling moratorium by a vote of 216 to 195. It would require the Secretary of the Interior to issue decisions on permits to drill within 30 days. However, Capitol Hill watchers say the amendment is broad enough to allow the federal ban on deepwater drilling to last its full six months, even as it shows political opposition to the measure in large numbers. BP announced on Friday, July 30, the creation of a $100 million charitable fund for workers who lost their jobs as a result of the federal bad on deepwater drilling. The oil spill has already cost BP more than $4 billion. The daily price tag to BP from the oil spill, which was estimated at $6 million to $7 million in the early days of the now ten-week-old crisis, has risen to an estimate of $38 million daily. BP has said the cleanup and containment costs related to the oil spill would largely be limited to 2010, but that the longer-term liability is impossible to quantify. BP took a $32.2 billion charge in its second-quarter earnings related to the oil spill, resulting in a $17 billion quarterly loss. The first BP relief well reached a depth of 17,810 feet. The second relief well, which was started May 16, has reached a measured depth of 16,000 feet. BP states that more than 87,000 payments have been made to claimants, totaling more than $266 million. Approximately 30,000 people, 4,500 vessels, and 96 planes are involved in the oil spill cleanup. These levels are down from a July high of 46,000 personnel, more than 6,400 vessels and some 113 aircraft. Skimming operations at the surface of the water have recovered approximately 827,000 barrels of oily liquid. In addition, nearly 300 controlled burns have removed an estimated 265,000 barrels of oil from the sea's surface. The total length of containment boom deployed to keep oil from reaching the coast is now almost 3.4 million feet (587 miles). The brown pelican, driven to the brink of extinction in the 1960s after the widespread use of the pesticide DDT, has rebounded in the Gulf and has become one of the poster-children, or poster-animals, for the widening BP oil spill impact on the Gulf Coast wildlife. It's no longer the 1960s Silent Spring, but a very ugly spring and summer, and beyond, for the Brown Pelican. The brown pelican was just removed from the endangered species list last year. It's not just the brown pelicans, but white pelicans, terns, gulls, shorebirds, skimmers and herons that are at risk with the oil encroaching on sensitive nesting and feeding areas along the Gulf Coast. The lawsuits filed by environmental groups have also been flooding into the Gulf region, though many are taking aim at the Interior Department of the U.S. federal government. The Center for Biological Diversity, the Sierra Club and the Gulf Restoration Network have all filed lawsuits making various allegations regarding Interior's Minerals Management Service ignoring law in its "too cozy" relationship with the oil industry. Some of these environmental groups also plan to sue over the U.S. District Court reversal of the offshore ban on drilling, lifted by a court order on Tuesday, June 22. From the biggest fish, the whale shark, which feeds in Gulf of Mexico waters during the summer, to the already endangered bluefin tuna, which uses Gulf of Mexico waters as a spawning ground, many fish species are threatened by the oil spill. There are 28 species of whales and dolphins in the Gulf, a majority of which inhabit Gulf waters year-round, according to conservation group Oceana. The evolving wildlife toll in the Gulf of Mexico would require an advanced course in marine biology to track, from spiny lobsters and all sorts of marine bivalves to oysters and fish larvae. Many of the Gulf species that feed on or near the surface, like the bottlenose dolphin, are impacted by the heavy crude oil that the human eye can see in photos or on television. Among fish species that support fishing businesses along the Gulf coast are snapper and grouper. Oceana notes that gag grouper spawning peaks in early April and red snapper spawning starts in late May, peaking from June-August. In effect, the spawning season couldn't be timed worse, and these vital fishing industry catches could see their numbers depleted. -- Reported by Eric Rosenbaum in New York. >>Will Tony Hayward Please Be Quiet? Copyright 2009 TheStreet.com Inc. All rights reserved. This material may not be published, broadcast, rewritten, or redistributed.